Ivonne O’Naturally interviews Infusio founder Philip Battiade about the power of exosomes. Exosomes are being heralded as the next frontier of cell therapy. While not being cells at all, they play a vital role in the communication and rejuvenation of all the cells in our body. Science has shown that the cell-to cell communication is important in maintaining a healthy cellular terrain. Age, chronic disease, environmental factors and genetic disorders can interfere with how our stem cells communicate with other cells, thus disrupting the healing process. Exosomes play a key role in the regulation of these communication processes. Exosomes are so-called extracellular vesicles, or small bubbles, released from cells, especially from stem cells. They act as shuttles for certain genetic information and proteins to other cells. They allow for cell-to-cell communication, transporting molecules that are important regulators of intracellular information between close and distant cells. They carry information from place to place with different functions and purposes telling cells how and when to react. Research has given us a valuable insight into the practical functionality of exosomes. By exposing the cells of an older organism to those of a younger organism we can see that exosomes from the young stem cells are responsible for rejuvenating the older cells. This healing mechanism can now be used in regenerative medicine. A degenerative disease comes from a continuous deterioration of cells, affecting tissues or organs. While stem cells are usually responsible for the rejuvenation of the cells, external factors may hinder the stem cells in this function. They may not be able to supply all the information needed. Supporting their function with external exosomes could have a greater positive effect, by providing new pieces of information to support the healing process. Who May Benefit from Exosome Therapy? Within the Infusio Concept, exosomes may help regulate processes within the body. Patients with Lyme disease, chronic inflammation, autoimmune disease and other chronic degenerative diseases may benefit from including exosomes in their treatment regimen. Lyme Disease is a very complex disease, caused by the Borrelia burgdorferi bacteria, which compromises the immune system. Tick-borne disease can also come with multiple co-infections. A combination of factors causes the onset of illness as immune system functions become disrupted leading to diminishing cellular health, immune function, metabolic function and dramatically increasing inflammation. Many Lyme patients often have dysfunction of the mast cells, increasing their inflammatory response. Inflammation is a central player in most neurodegenerative diseases as well. Incorporating exosomes into a multi modality treatment regimen may help break the inflammatory cycle and provide the body with necessary cellular information to facilitate healing. What Are Exosomes and How Do They Work? Exosomes are extracellular vesicles, or small bubbles, released from cells that act as shuttles for genetic information, proteins and messenger RNA to other cells. This usually happens in response to injuries. Generally speaking, Exosomes carry healthy and lost information and insert this to target cells. Exosomes released by young stem cells have shown to be very powerful in regulating regenerative processes in the body and assisting in rejuvenation. Exosomes from stem cells contain valuable cell information consisting of proteins and genetic information the cell needs to function correctly. These stem cell derived Exosomes have also shown to assist in transferring NK cells (Killer cells) into T-Regulator cells (Helper cells) By that they assist in calming an overreactive immune system and modulating it to respond in a coordinated fashion. They can also be used as a delivery system for medication. Exosomes are administered as an IV treatment or IV push. As a part of joint rejuvenation therapy, exosomes are administered directly into the affected joint area. The normal concentration is 1 billion exosomes per 1ml. One treatment may consist of up to 15 billion exosomes. The dosing is individual to every patient and there is no set or established protocol. In some cases, exosomes may be combined with focused ultrasound, frequency therapy or regional hyperthermia which may help attract them to a certain area in the body. What Can I Expect After the Procedure? Are There Any Side Effects? Exosome therapy is usually performed on an outpatient basis. Most patients should expect to leave the clinic without any down time. The patient will not experience any discomfort. Less than 10% of patients have reported developing a mild fever, headache, nausea or vomiting. However, these side effects have never lasted more than three days and usually resolve within 24 hours. No long-term negative side effects have been reported. When Can I Resume Physical Activity? Are Exosomes Safer Than Stem Cells? Both stem cells and exosomes have their place in a treatment protocol. This much depend on what the treating physician is trying to accomplish. When performed correctly, treatment with exosomes and/or stem cell therapy is safe. Therapy with exosomes may carry a lower risk of complications as exosomes do not require an invasive surgical procedure for harvesting. Also, the use of embryonic stem cells may be connected to the risk of developing tumors. Stem cell derived exosomes can be safely harvested and do not proliferate but rather transfer valuable biological signals to the recipient’s tissues and facilitate the normalization of various pathological processes. Are All Exosomes the Same for Every Patient or Can They Be Individualized? And How Would They Be Individualized? There are different types of exosomes. There is a general standard exosome solution produced from placental derived mesenchymal stem cells. These stem cells are GMP laboratory stem cells, which have been screened and certified. The end product contains many anti-inflammatory cytokines and immune modulatory proteins. It is also possible to produce different kinds of exosomes. Some involve the use of a patient’s own tissue to provide specific markers in combination with laboratory produced exosomes. There are several techniques that involve frequency medicine, focused ultrasound or targeted heat to attract the exosomes to a certain area of the body. The legalities in each country also play a role in what is possible. The treating doctor can decide if individualization is necessary and what that best type of individualization may be. What Lab Do You Source Them From? Exosomes are sourced from laboratory grade, GMP certified mesenchymal stem cells. Placental mesenchymal stem cells produce the exosomes with the correct expression for our use. We have our own GMP labs in Germany and Shanghai in which we can produce exosomes. We have also been cooperating with Dr. Duncan Ross from Kimera labs on working towards developing an INR for the use exosomes to patients with specific indications. We also use some exosomes from Kimera Laboratories and other laboratories as a basic product. Exosomes are suspended in saline and must be kept frozen. How Are the Exosomes Screened For Safety? Is There Any Risk of Viruses Being Passed on Through Exosomes? The starting material (mesenchymal stem cells) are GMP laboratory grade, meaning they have been screened for disease, viruses and bacteria. Once the exosomes have been extracted, the stem cells are discarded. The finished exosomes solution is sterile filtered and tested according to the standard pharmaceutical regulations for sterility. Is There Any Theoretical Risk of Viral Reactivation with Exosomes? This would be extremely unlikely. It is possible though to have an immune response to viruses due to the immune modulation. This is not viral reactivation. Is There Any Theoretical Risk of the Body Rejecting Exosomes with Them Being a Foreign Substance? This is extremely unlikely as there are no immune markers on the surface of the exosomes. They are not cells or tissue. It may be possible to experience die-off reaction after receiving exosomes as these activate the natural killer cells to become T-Regulator cells. For this reason, we always give a small test dose before applying a larger dose. Is There Any Risk of Them Forming Teratomas? No, as they are NOT embryonic stem cells. Exosomes do not multiply. Exosomes transfer valuable biological signals to the recipient’s tissues and facilitate the normalization of various pathological processes. Will People Need Multiple Rounds of Exosomes, and If So, How Should They Be Spaced Apart? In some case a follow-up treatment may be advised. There is no sustainable data about standard dosing and the treatment is as individual as the response. Some patients may need a single application, while others need multiple doses or a small booster therapy. In some cases, therapy may start with a small initial dose which is increased over time. How Do They Work for MCAS? Is There Any Risk of MCAS Getting Worse If It Shifts Your Immune System Further the Wrong Way? Exosomes insert information in the cell. The information is basically ‘This is what a healthy cell is like and this is how to get there”. This process happens in 2 stages. In the initial phase the exosome inserts proteins into the cell. We know exosomes contain a whole array of inflammation regulating proteins. These basically quench the immediate inflammatory response. The exosomes also insert messenger RNA into the cell which is the recipe and instructions for the cell to make its own inflammation regulating substances. One has to keep in mind that MCAS is only possible with dysfunctional or damaged mast cells. Exosomes are thought to insert the missing information into the mast cells to help normalize or stabilize them and prevent them from being dysfunctional. How Long Do Exosomes Work in the Body? What Is the Timeline? Exosomes trigger a so-called bi-phasic response. First, an immediate reaction. This usually last about 24 hours until the initial proteins have been broken down. Then the messenger RNA, which has been inserted into the target cells becomes active and helps ‘reprogram’ the cell. This usually takes 6-8 weeks. So the timeline is about 8-10 weeks. The continued effects may continue for months afterwards. Are Exosomes the New Immune Modulator? Immune modulation is part of Infusio’s Five Steps to Health approach which uses supportive therapies to reestablish foundational body systems and functions. This includes establishing a healthy immune response by balancing the immune cells and sensitizing the immune system to pathogens. An immune response may be enhanced or suppressed by exosomes depending on their cell of origin and its functional state. Stem cell derived exosomes have been reported to impair dendritic cell maturation and to regulate the activation, differentiation, and proliferation of B cells. They have been shown to control natural killer cell activity and to suppress the innate immune response (IIR). Studies reporting the role of exosomes on T lymphocyte modulation are controversial. Therefore, while exosomes may assist in immune modulation in some cases, we would still consider at other immune modulation therapies like thymus therapy to support the immune function. Is There a Follow-Up After Exosomes (100 Day That Follows SVF)? Exosome are a form of cell therapy and a similar timeline can be applied when it comes to assessing the body’s response. Therefore, the same follow-up routine is scheduled, and the progress is measured after approx. 3 months to determine the customized follow-up treatment protocol and home care protocol. Do They Multiply in the First 100 Days like SVF or Only Work at Signaling Cells Without Multiplying? Exosomes do not multiply themselves but can assist other cells in their proliferation by inserting missing cell information in them. This before mentioned bi-phasic response will last approx. 3 months and can influence the stem cell activity in the body. What Are the Signs That Exosomes Are Working and When Can a Person Can Expect to See the Benefits? The bi-phasic response can be accompanied with a certain set of symptoms. These may indicate that the exosomes are assisting in the repair and regulation process. In the initial phase patients generally report a reduction of their inflammatory symptoms. The following weeks can be accompanied with light flu-like symptoms and fluctuating energy. After 6-8 weeks the second phase of the response takes place in which the information the exosomes transferred to the cells is used by the cells to regulate and reprogram the cell function and aid in repair processes. This process can again result in episodes with low energy or light flew like symptoms and a flare up of your individual symptoms. Typically, early benefits of therapy are observed in 3-4 months. However, it is not uncommon, to see the benefits after 9 to 12 months. If SVF and Act Caused MCAS and Could Have Potentially Made Lyme Patients Worse Can Exosomes Rectify it? There is no indication that MCAS is caused by ACT or SVF. 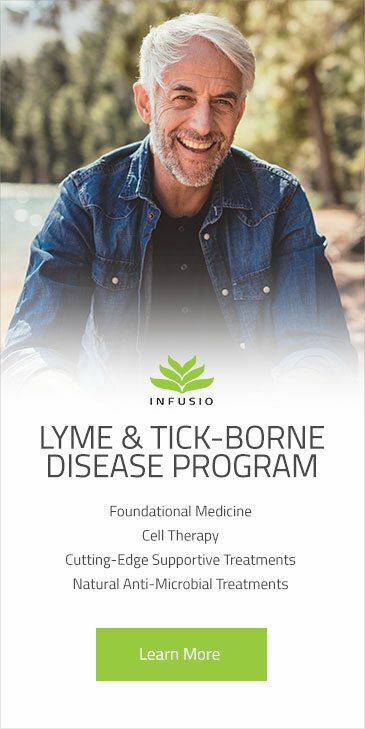 We have observed that with many MCAS patients the treatment protocol was able to establish a healthy regulation capacity and immune function and the lab results of the majority of patients indicated no more active Lyme infection. As Borrelia bacteria can be responsible for invading and suppressing the immune function, once Borrelia is not adapting the immune system anymore and a healthy immunity is established, underlying conditions like MCAS and the symptoms related to the condition can surface. This condition may require additional treatment and exosomes may present a viable option for these patients. If I Get Exosomes Versus SVF and Return in 4 Months Can I Get a Second Round of Exosomes Instead of ACT? Exosomes can be added to the ACT follow up protocol if your physician recommends it. There is also the possibility to replace the ACT with exosomes depending on your individual progress and symptoms. This will have to be decided on a case-by-case basis. There may be an added cost that will be quoted in advance if exosome treatment is recommended. the cancer cells and stop their replication. Do Exosomes Help Chronic Inflammation? Recent research has shown that stem cell-derived exosomes have an anti-inflammatory potential and induce high levels of anti- inflammatory cytokines and can therefore assist to regulate the inflammatory response. In addition, they can also inhibit abnormal macrophage activation. The macrophage is a large white blood cell that is an integral part of our immune system. Its job is to locate microscopic foreign bodies and ‘eat’ them. However, disproportional macrophage activation can induce undesirable inflammatory processes. Can Patients with Chronic Infections and Autoimmune Diseases Benefit From Exosomes? Chronic infections have a lot in common with autoimmune diseases, including dysregulated immune response incapable of protecting our body from intruding pathogens (bacteria, viruses, molds etc.) while attacking its own tissues and organs thus causing significant structural damage. One of the key mechanisms controlling the direction of immune responses is a balance between specific immune cells involved in protection vs autoimmune responses, the Th17/Treg ratio. Exosomes from mesenchymal stem cells have shown to normalize the Th17/Treg ratio and bring the deviant immune response back to normal. Can Exosomes Benefit Neurodegenerative Diseases? Research has shown that exosomes can penetrate the blood-brain barrier and stimulate neuronal differentiation, neuronal growth, and suppress inflammatory processes within the brain tissue. Macrophage Immunomodulation: The Gatekeeper for Mesenchymal Stem Cell Derived-Exosomes in Pulmonary Arterial Hypertension?